When I arrived at The Trust Arena, Tyga was due to go on. So I was quite surprised to see people still hanging out the front. Though most of them seemed to be meeting friends. When I got in there the 1st thing I noticed was how the crowd was split. VIP area in the front, standard GA in the back. These separations worry me as I wonder if they are going to fill the VIP area or is it going to look sad. But later as I went into the crowd to get some photos I noticed it did fill up in both areas. It was a decent sized crowd. 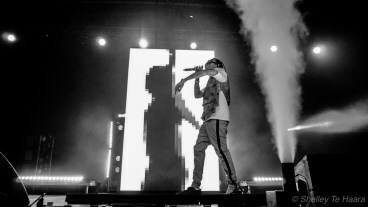 There really isn’t much to tell you about Tyga’s set. I couldn’t tell you all of the songs as I don’t remember every song he played. He even performed songs he was only featured on. I got Tyga’s setlist at the end of the night and that didn’t even have every song. I think that threw him a bit as he looked down at his setlist quite a bit. Though I suppose it’s hard because he didn’t really perform full tracks. It was a lot of snippets. But I definitely got to hear the 2 I wanted to hear which were ‘Floss in the bank’ and ‘Rack City’. Tyga had a simple yet effective stage set up. There was a thin screen in the middle which displayed coloured graphics, music videos, and other related imagery. Occasionally pyro or C02 cannons would go off. He was also joined by 4 dancers which, didn’t do anything insanely amazing but I felt like it added well to what he was rapping about. What I particularly liked is that, even though a lot of rappers rap over tracks, most of Tyga’s was his own vocals with no backing track except in the chorus occasionally. You could really hear Tyga’s vocals and that man was dressed super well. He somewhat gave off a bit of a shy vibe sometimes, it was quite interesting. Though the way he commanded the stage, he was not shy. Tyga even decided to get closer by jumping on to the front speakers and then eventually jumping down to the barrier to say hi to everyone in the front.